Since I began my sabbatical a few weeks ago, my family and I have been attending a neighborhood church. The experience has been refreshing, most of all because I am getting to experience worship again as, well, a worshiper. As we prepared to worship, I was trying to grasp onto the culture there: How many songs would there be? Would people raise their hands? Most of all, I was wondering, Would I know the songs? Refreshingly, they played a couple that I was familiar with. E3 has been doing “Our God” for around a year, and I’ve sung “Revelation Song” here and there. As a worshiper, I loved this familiarity: I knew the melodies; I knew the lyrics; I knew the message. As a church leader, it provoked my thinking in some interesting ways. As a songwriter and a pastor, I’ve been adamant about original worship music. I have believed—and still do—that the local church should be as diverse, unique, and fresh as our God. The local church should have an infinite amount of expression and variation to it. In my opinion, liturgical worship has many different benefits including the idea that wherever a believer goes in the world, the liturgy is the same. She can engage immediately in worship, no matter whether she is at her home community or halfway round the world. In the interest of creativity, is it possible for a local church to become too insular, so that its musical worship is only intelligible and accessible to its immediate community? Should a church maintain an eye towards global expression—the “Big C” Church—when it prepares on Sunday? And, given that the most evangelical, non-denominational churches don’t employ the liturgy, should we embrace that the “Big Three” (Tomlin, Crowder, Hillsong) are, in fact, as close as we can get to a common worship language? I don’t advocate picking songs based on the iTunes worship charts (I actually freelanced at a church that did that—quite distasteful), but as a worshiper who had come from another community, I can tell you that I appreciated the fact that I “understood the language” of this church (they also used the Lord’s Prayer and a couple familiar liturgical elements). I also don’t think the local church should shy away from fresh songs and creative diversity; however, I think we should maintain a certain eye towards both the transient nature of our culture and the global expression of our faith. This entry was posted in art // music, leadership and tagged chris tomlin, worship, worship leading. Bookmark the permalink. Thanks for your blog post, Eric! I have a LOT to say. When I think about the Big C church, how many people outside of evangelical, non-denominational churches knows about the Big Three you named–who are all of the same racial origin? In the gospel world, there’s already a canon of music that people grew up listening to, plus songs now that are a part of that canon. Big C Church is pretty diverse, with more intersectionality–race, gender, cultural upbringing, class, region, etc. Questions that should be asked are whose songs are getting out there to everyone and who is choosing songs as canon? When the Church was more limited to Europe, the Protestant wing of the house, it makes sense that all those hymns we still sing are canonical. It’s also been hundreds of years and that’s, as far as I know, was where the action was. But now? Those Big Three you are positing are, to me, still talking about little c church, within evangelicalism and not the Church at large. Also, age plays into this. The church I grew up in, we were heavily into Integrity (kinda makes sense. One of our leaders wrote for them, and they were based in our state). It’s not as full of young people as it used to be, either. I had visited a couple of years ago, and the worship style was kind of staid. I didn’t feel a freshness there, but it was reflecting the congregation. But it’s an evangelical church, mostly white, mostly upper-middle class. But who is passing down the songs that I sang as a teenager to the next generation? I’ve no clue. Plus, evangelicalism is relatively young in terms of a movement, compared to, say, Presbyterianism. Will there be songs that persist that our grandkids and great-grandkids will sing? It’s hard to say. Maybe the songs that Tomlin, etc produce will last over time. But they truly seem so recent, just like evangelicalism. How many Maranatha! songs are still being sung? Or Vineyard songs? Twila Paris? If any, then they have been around for a little while longer (70’s and 80’s). With that in mind, the way I saw God move when I was growing up was through music. Maranatha was such a big deal since I believe they were trying to create new hymns that had more of a hipper vibe. I believe they somewhat succeeded. But those songs were markers for growth and experiences–just like how music is in my life, a sort of soundtrack. All those worship groups and writers I named, and you named, will be a part of my worship language until I die. So will all the gospel songs I sang, as well as the Latino songs I sang. So will the hymns my parents loved to sing. But that’s what I was exposed to, and I’m very fortunate that they were literally all over the map. So the Big C Church now is about a growing polyphony, like in Acts 2. I went to a Methodist church a few years ago and didn’t recognize any of the songs, but people sung with such joy, in this kinda hippie free that I wasn’t used to. But I didn’t mind it. It was their flavor of self-expression. Music itself is a universal language (random: Paul Simon’s Graceland doc which was on PBS really exemplified this). I’m more of a free-flowing worship style, and I liked to change it up every so often. I’ve also been blessed from being in a monastery for a week, with its regulatory, predictable times of prayer, worship, and meditation. Yet it’s not how I’m spiritually wired. It’s not my culture. My mom’s side of the family is Presbyterian, and my dad just landed into evangelicalism on his own as a young man. But even as I’ve mature into my own adult self, that’s not what I’d be comfortable with now. It’d be great to go listen to some house music and dance around. Or sit in silence in meditation and prayer with no music. Or…who knows? There are so many ways to express oneself musically and spiritually. So I enjoy going into other churches and seeing how they do things differently. One of the reasons I’m not in a community now is that I’m incredibly bored with most liturgies. That sort of predictability, for me, rocks me to sleep and I can’t be engaged when it’s welcome-song-song-song-greet each other-song-offering-song-sermon-dismissal. For some reason, that type of liturgy stifles my creativity and my self. But for others, they love that they know what will happen. And that’s completely OK, but I don’t know if having a Starbucks kind of mentality about liturgy is good–meaning, you’ve been to one Starbucks, most likely you’ve been to all of them. They look the same, act the same, function the same (except the one on North and Wells that stays open late at night). Do people want to or need to be comfortable all the time with worship structure? Should they be challenged and stretched every once in a while? Should they visit other rooms in the house of God and see how others express themselves and join in without appropriating it? In my opinion the answers are no, yes, and yes. I’m studying about autobiography and life writing right now, and in terms of self-expression about the self, the same thing is happening. It’s not about just European men with property writing about themselves, which marginalized everyone else and their stories. Now it’s about more and more different types of people having access to a global audience–whether it’s through a blog or performance art or Twitter. Our stories all tell something universal about the human condition, and connect us together. Story, like music, is a universal language. OK, I’ve thrown a lot out there, and some of it seemingly contradictory, but this is where I land: when the Church continues to become more and more inclusive, the songs and liturgies that Christians sing and participate in will continue to change. And this is a very good thing. That polyphony reflects God’s infinite nature, meaning we’ll be able to see different glimpses of God that we couldn’t experience otherwise. What’s most important to me is that each faith community has the freedom to explore how they want to worship, in their tongue, in their personal expression. That freedom of expression, to connect to God through who you are, is what unites Christians across the world, not necessarily the songs themselves. Thanks so much for this Deborah! I always love to hear/read the way your mind works. I think I’m tracking with you on most of this… I think where I split a little bit is in talking about the liturgy and “predictability”. I guess I’m at a place where I don’t think of it as predictability (or if I do, I welcome it); I look at it as structure to enhance the direction of my thoughts. This may be because liturgy is still sort of new to me, but I like the way one theologian put it, suggesting that we look at liturgy as a crutch, a “teacher” to help us form thoughts about worship and God. To that end, I know all Starbucks are the same, but that’s not really the point. The point is a decent (didn’t say GREAT) cup of coffee. From time to time, Intelligentsia is what I CRAVE, but I had to get to know coffee culture through Starbucks, and that’s not a bad thing. That’s as far as I’m taking that coffee metaphor. The truly exciting place to be would be at the intersection of liturgy, original music, and then coupled with the voice of the “outsiders”… That could be a powerful experience. 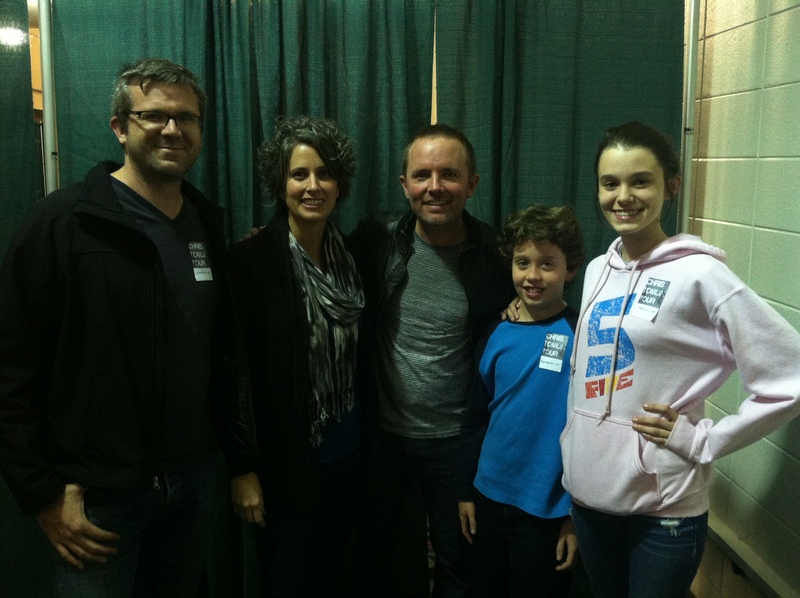 So I totally agree with this post but HOW DID YOU MEET CHRIS TOMLIN? i had some thoughts too but i’m pretty sure they’re probably rubbish compared to the above comment. and so, here is a cat face in lieu. Eric, I’m definitely tracking with you on this. And I do believe as you said toward the end of your post that it will have to do with a balance between the unique expression of each local body (as we will be encountering a different process in our communities that we might express uniquely with songs that will express our own journey with Christ and all the blessings and curses we face together) and the body of Christ at large. I believe there is room for both but finding that balance is the challenge. I love new songs. I love writing songs and sharing them with the community God has called me to bless with what I have to offer. But I love hearing the expressions of God’s body everywhere. Part of the challenge for me is allowing enough time with a new song in the midst of the body for it to become familiar. I have to remind myself that the songs that have become trademarks of our faith (songs, hymns, and spiritual psalms) were once new songs that nobody knew. Another battle we face is the current rate of change that we live in. I often think about how music used to be defined by a century, then a decade as we refer to ’50’s, 60’s or 70’s music, and then the nineties hit and it was “early 90’s” or “late 90’s”. That coupled with the greater and greater access that we have to so many cultures and their unique use of music and instrumentation. All that being said, I love to enter an environment with worshipers gathering from all over and be able to join together in a familiar song and I love to share or receive a new song. I also feel like the reality of the worlds connectedness at this time in history has the potential to help us share our new songs with one another in a way that will give us a more and more unified experience in Christ while glorifying God in the endless diversity and creativity found in the people of his Church universal, who were created equally uniquely in his infinite image. I love God’s creativity and unity. How do we celebrate both? Sorry if his was all over the place…welcome to my head. Thanks for sharing Eric. IMO I think the beginning of celebrating God’s unity and creativity is simply being willing to live in the tension of both of these characteristics. I’ve sat with church pastors who were adamant that their church play ONLY original music, and I’ve been with ministries who refused to play any original music if it couldn’t “equal” the quality of Matt Redman, Charlie Hall, et al. I think being willing to engage in both sides of the discussion is at least a healthy starting point.